So last night I was paid a visit by my old friend Insomnia. It’s an occasional visit, that I neither relish nor expect, but have over the years come to accept due to my overly active imagination. As I tossed and turned and did my utmost not to disturb my funny fisherman on the other side of the bed, I started thinking about work. The proposals, billings, deadlines. The things that keep me busy for at least 40 hours of my week. And then I started to wonder, not for the first time, why do we do it? Now obviously I know, practically, we need to work, in order to have money, to pay the bills. To eat. To have a roof over our heads. And, for me personally, to fund my insatiable appetite for chocolate. For one moment can we just set that all aside? And ask the glaring question, which is begging to be asked – Where did we go so wrong? As a society, as humanity, when did we decide that the norm will be, to put on our big peoples’ pants 5 days a week, for up to 50 years of our lives, and march ourselves off to the daily grind? This is not normal. It is an unfortunate reality, yes. But I will never accept this as normal. Normal should be us humans living in harmony with the earth. Working our own little piece of paradise and enjoying the fruits of our labour. Spending our days creating, and baking and breathing in the sweet fresh air of freedom. Living. Now I know this may sound a little happy hippie, hug a tree, BUT, could you truly say that were you given the opportunity to live like this you wouldn’t grab onto it with both hands and never let go? Instead, we spend so much of our lives behind a screen with meaningful human interaction being relegated to the 2 days on either side of this madness. Madness. I am not a robot. Though I have often marvelled the benefits of having more than two arms and maybe more than one brain, I believe this is due to the crazy conditioning, we are faced with daily to do more of what’s expected and feel less. Human. I am a human. I want to feel human. To laugh. To cry. To be a friend and a lover. A big, fat, emotional mess. But a mess that overflows with love for all things great and small. One of the scariest realisations I have ever had is that the time we are allocated for this lifetime is finite. And that unlike money, once it is spent, we can’t just go out there and make some more. However, it isn’t all doom, gloom and unhappy endings. The perception of time can be altered, depending entirely what you do with it. Happiness, friends, family and the pure joy of being free, amplifies the time we have. The relationships we build and the love we create make us infinite. And that is really the only way to live forever. How long is forever? 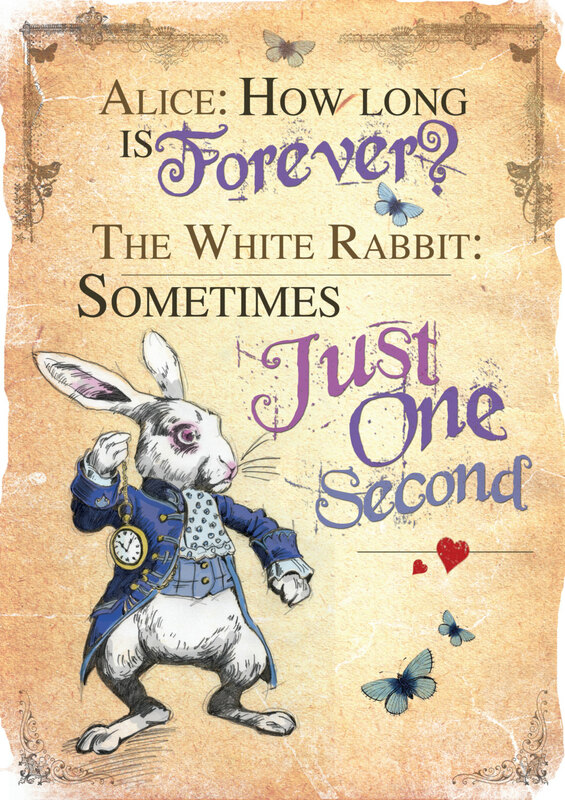 Well, that is a question I will leave to The White rabbit to answer. So because I have bills to pay and chocolate to consume I will put on my big girl pants tomorrow and again the day after and most probably, the day after that too. But I will be damned if somehow, someday, in the not too distant future, I don’t find the magic elixir that will allow me just to live. To breathe in the fresh sweet air. To bake. And to create. I can relate completely. We sometimes need to take one step back to move two steps forward. Enjoyed reading your article. Wow!!! What truth. You are an inspiration. Yes, I believe we limit yourselves with the perception of time. We have enough time to do all that we want… We just fear going out and doing what we really want and not what we responsibly feel we should do. And of course, we use time as an excuse to not do the things deep, deep down we really don’t want to do. I believe in the Hopeless Romantic and I believe there is a way to live in your bliss and be at peace and not just visit it occasionally in your “free time”. Look forward to your next thought-provoking and inspiring post. Riiiight?! I I love this,I just wanna be human too man! I actually recently wrote a post about how art is practically the only discipline in which we can just be exactly that. This post almost an extension of it. Thank you kindly. The truth resonates in all of us!